I woke up this morning, really excited about the day. It was going to be a big day. I was going to have the privilege of sitting at the Head Table for the National Press Club luncheon today. 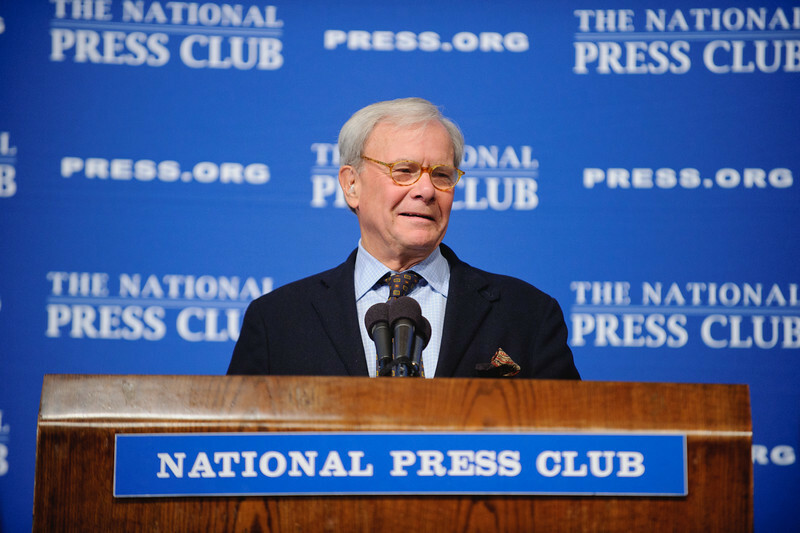 Oh, let me mention, the speaker was going to be TOM BROKAW. 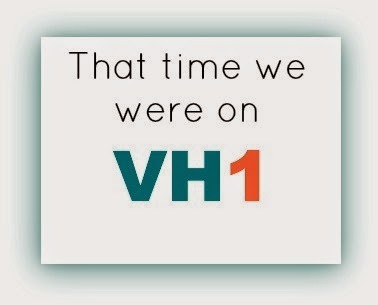 But first, I went to work like any normal day, except when I got there to tape our show today, I had to run Playback. Read: I had to roll the soundbites for our show. Which was kind of hilarious because I do not do math well, and am not very technical. 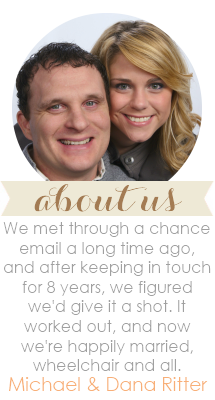 But, miraculously, I didn't screw up! Yay me. After that, I hopped in a cab, and headed over to the Press Club! I tried to do something with my hair in the cab, but it was a flat mess. Oh well. When I got there, I was so thrilled to see my old friend, Charlitta, at the pre-luncheon reception! We were camera/stalking buddies as Mr. Brokaw entered the room. I took a picture for Charlitta, but I was told since I was at the head table, to wait. I was nervous I wasn't going to get a picture with Tom Brokaw, but I did! Yay. Check! When the President of the Press Club was introducing the Head Table, he introduced me as the White House Producer for CBN News and the owner of a dog named Brokaw, no disrespect. The crowed laughed, and clapped and I tried to explain to everybody that naming my dog after Mr. Brokaw was a good thing! I thought for sure, when he stepped up to the microphone, that he would say something about my Brokaw. But, unfortunately, you know who was seated two seats down from me? Freaking Walter Cronkite IV! Yeah, as in THE Walter Cronkite's grandson! So, when Tom stepped up to the mic, he shared a couple of funny stories about Walter Cronkite II. Oh well. 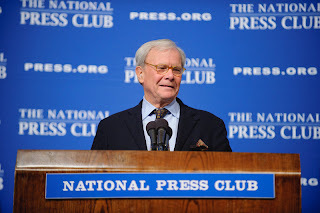 I really, really enjoyed Mr. Brokaw's speech. He spoke about the theme of his new book, and talked a little bit about education, and how journalism has changed, and the nerd that I am, yes, I took notes right there on my iPhone. 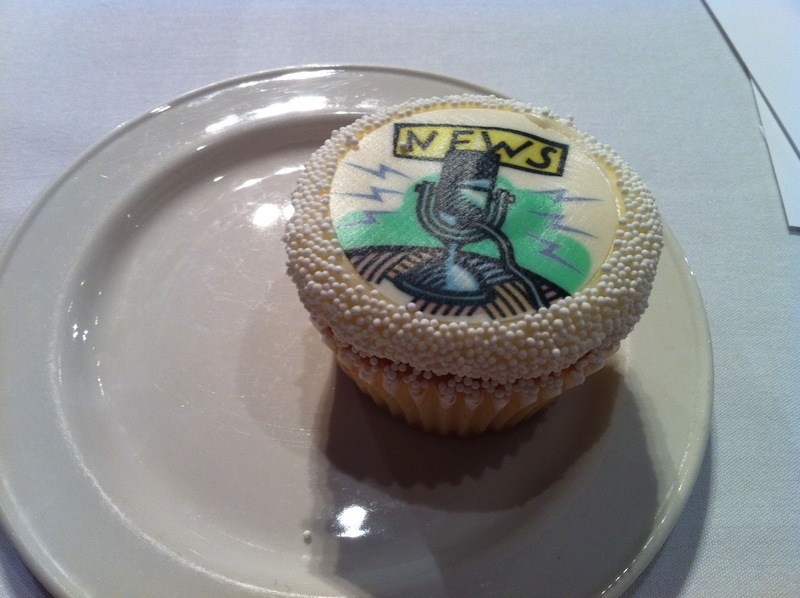 And, I took a picture of my cupcake. And, then I ate it. What a COOL lunch, right? Charlitta gave me a ride back to work, where I pinched myself for the rest of the day, as I performed inbox maintenance, thought about the next couple of Presidential debates, and imported the discs from the show we shot today. 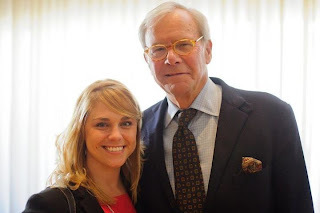 Then, my friend Sarah sent me the picture of me with Tom Brokaw, and I had flashbacks of being a little girl, and watching his live report on the Berlin Wall coming down. 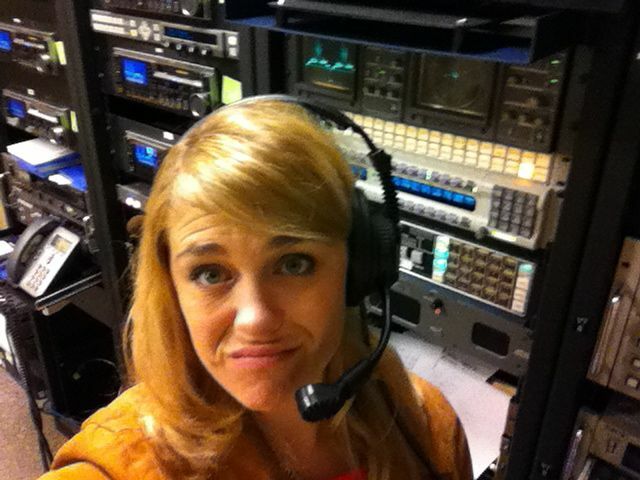 Flashbacks of being a 6:00pm producer in a small market, who would always stay in the control room for an extra minute after my show was over to watch the headlines for Nightly News. My dream job (I thought at the time) was to be the producer who put those headlines together! Tom Brokaw is one of my major professional inspirations. 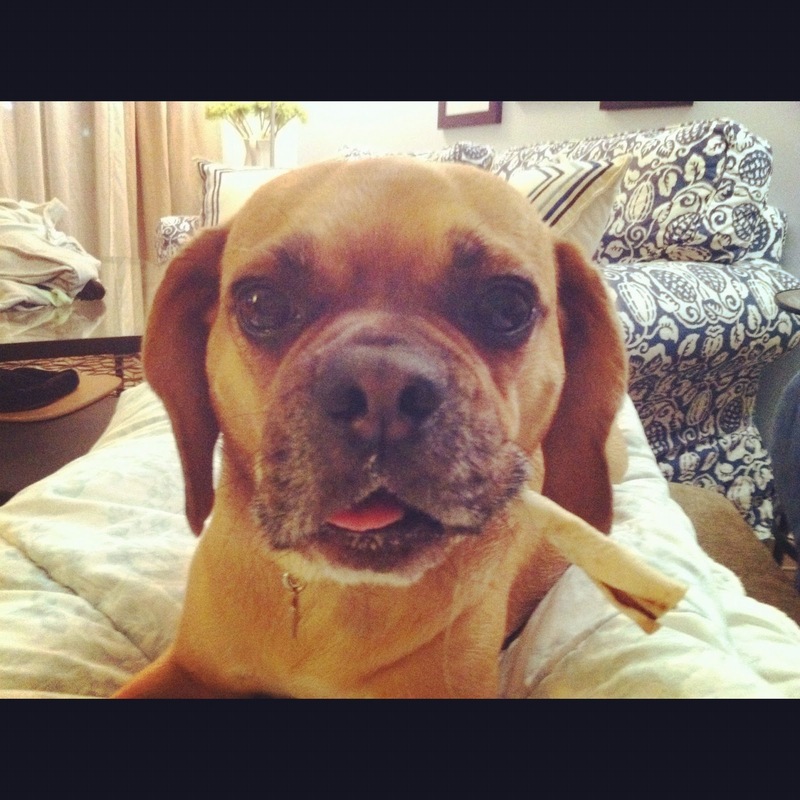 When I got my dog, I got a boy dog so that I could name him BROKAW. This afternoon, I drove home, anticipating a yummy dinner because, as Michael wrote yesterday, tonight was National Men Make Dinner Day or something like that. 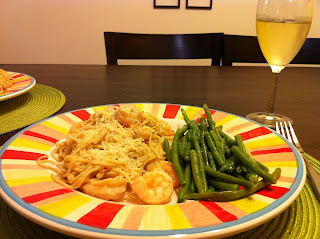 All I knew this morning was that I was asked to get some angel hair pasta out of the pantry, and take some shrimp down from the freezer to thaw. He had me at shrimp. House smelled amazing when I got home. And somebody was real proud. 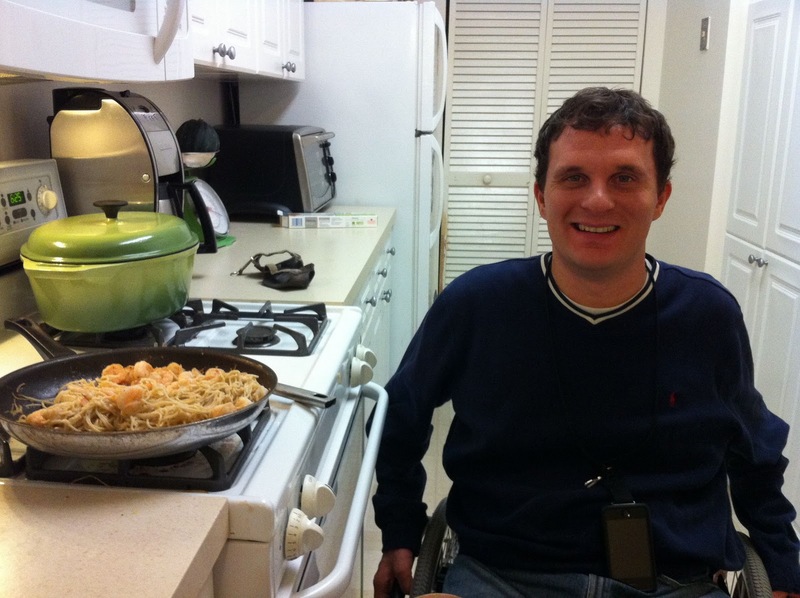 Almost as good as dinner, was the really, really cute proud smile Michael had on his face. So sweet. Caught myself smiling from ear to ear as I read your post. SO FUN! Thanks so much for sharing. I kept thinking about you today, getting to meet your inspiration up-close-and-personal! Got your picture taken with Tom Brokaw . . . AND a dinner made by your adorable husband . . . all in one day? You are a BLESSED WOMEN!